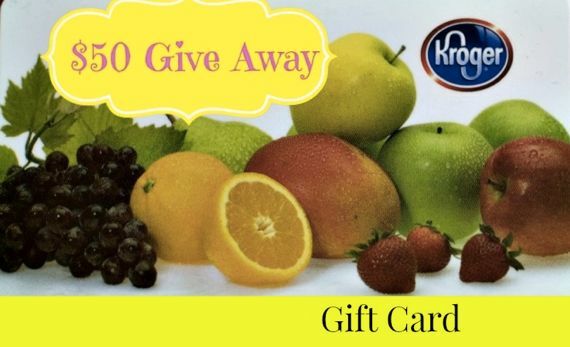 The long awaited Kroger Marketplace, located at 1203 Murfreesboro Road, Franklin, Tennessee, has finally opened its doors with a bang of a grand opening, meaning lots of value and choices for customers and $50 Gift Card giveaway in the rafflecopter below. In an effort to get the word out about the new 84,000 square food build-out in the old Goodwill building, Kroger invited some Nashville bloggers in for a tour and lunch. 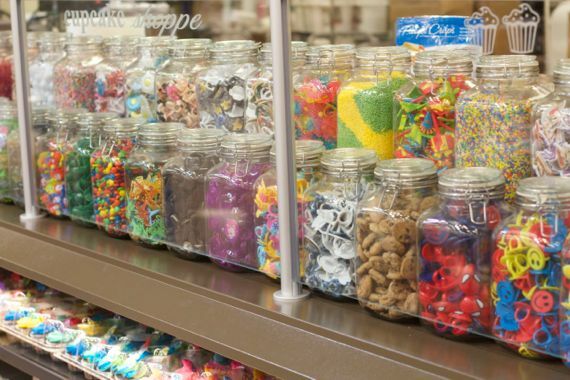 A grocery store is a very big deal to a food blogger. The first thing I’m often looking for is variety, choice, and a good price. When there are extras that save me a trip, all the better. 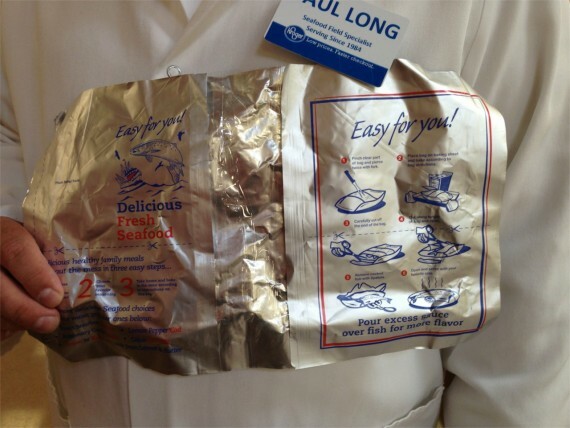 Kroger Marketplace offers several things to customers that many stores don’t have. Gas Station and Fuel Points for Gas – When you shop at Kroger and use your Plus Card, you’ll earn 1 fuel point for every $1 you spend. Every $100, get 10 fuel points. For example, if your card shows you’ve spent $500, you will have 50 fuel fuel points, meaning, you can fill up your tank (up to 35 gallons) for $.50 off each gallon of gas. If you get 20 gallons, you have just saved $10. There are ten pumps in front of the store for your convenience. (The maximum savings will be $1.00 off per gallon, but you can store your points). Additionally, you can earn 2x fuel points on Gift Cards, (excluding Kroger Gift cards), No-Contract Wireless Phones and Airtime Cards! Double points are in effect now until July 27th at this location. 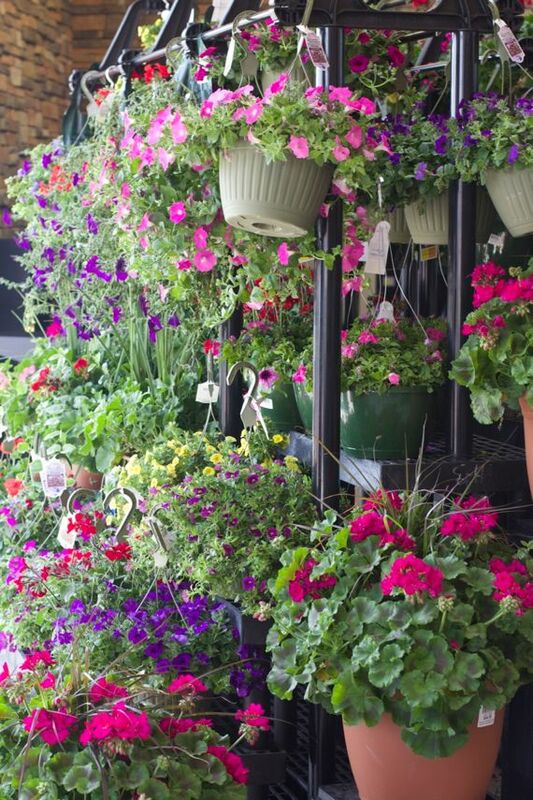 Flowers and plants for Indoors and Outdoors – Plants for the garden, or flowers for gifts or just to make your home more beautiful. 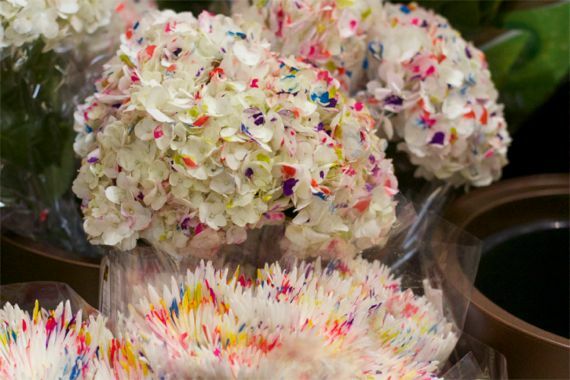 These are especially pretty, reminding me of confetti cake. 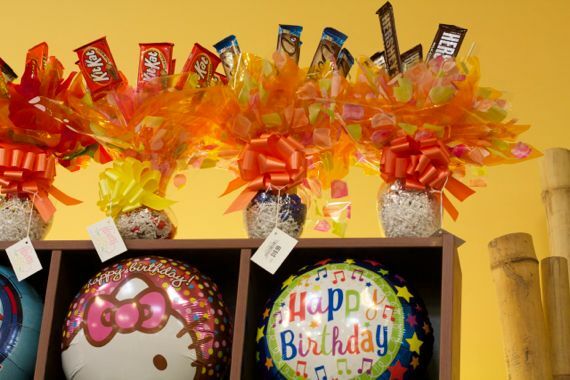 Candy Bouquets – Choosing a favorite candy bar, it’s a whimsical way to say I love you. Furniture – Outdoor patio furniture is available to walk away with. Books – There is an aisle that serves as a mini bookstore, and Kroger graciously gave us each a bagful. Cafe Area with free wifi – You can order hot food, cold sandwiches, sushi or something off the salad bar, take it home or sit in the bright and cheerful cafe, which a lots of windows. 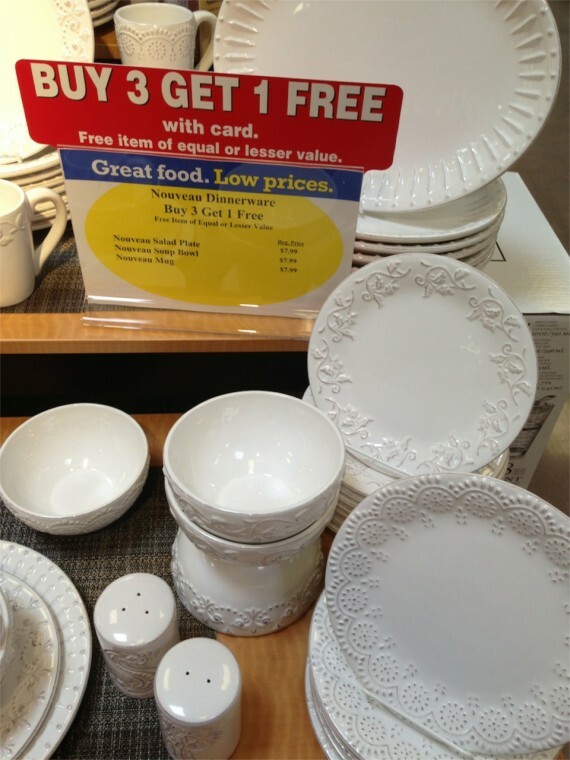 Dishes – I’m a huge fan of white dishes and there is a special value for two different white dish designs. These are really pretty. Kitchen/Household Items – Everything you need to cook everything you want including serving dishes and glasses. The Little Clinic – Families are front and center at Kroger. Next time your child has a bad earache on the weekend, go to the little clinic, not the emergency room. 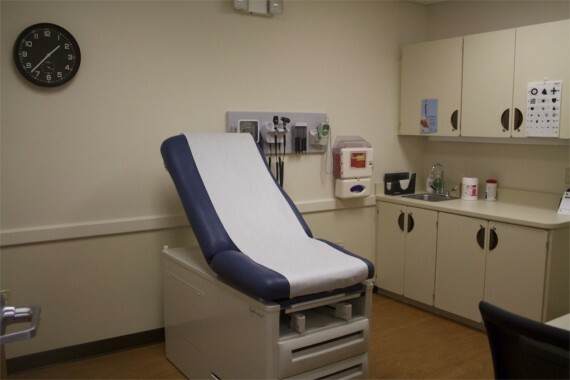 Some of the services provided include sports and school physicals, dept. of transportation physicals, flu shots. 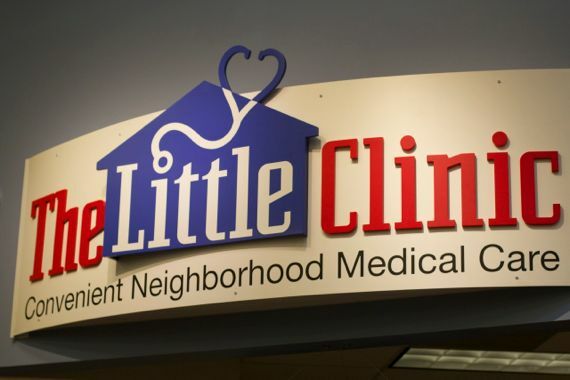 Read more about The Little Clinic and how your family can benefit. A pharmacy is located in the store, open 7 days a week with a drive-in window. Extended Hours -this location is open 24 Hours a Day. How convenient is this? These are some of the items, Kroger sent us home with. 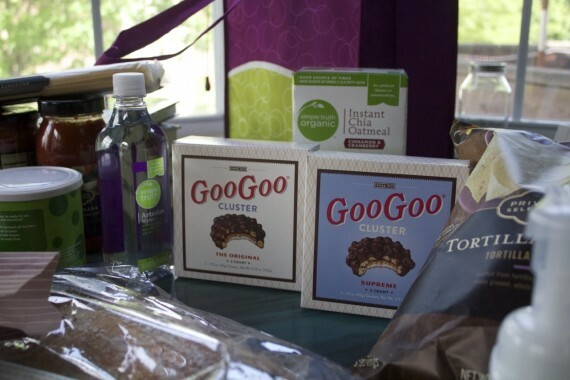 Goo Goo Clusters are a Nashville locally made candy bar, and they’ve been around for over 100 years! 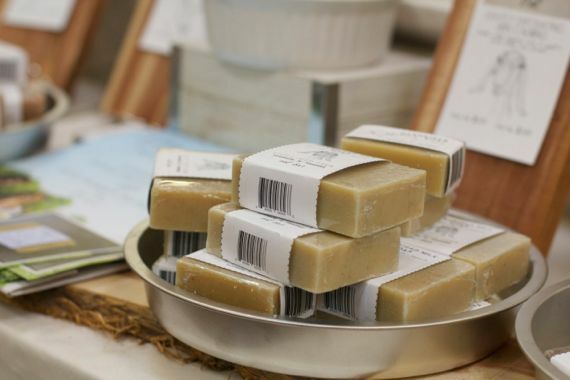 Locally made products are featured like Farmstead Milk soap, made with goat’s milk, olive oil and honey, handmade in Tennessee. 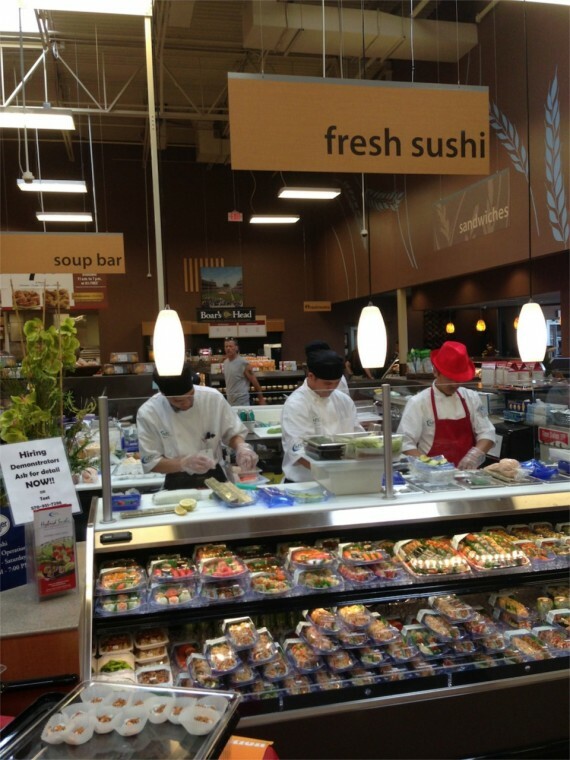 Food at Kroger is front and center, offering more varieties than many grocery chains. I was very impressed with the cheese selection, which may just surpass any cheese spread in Franklin. 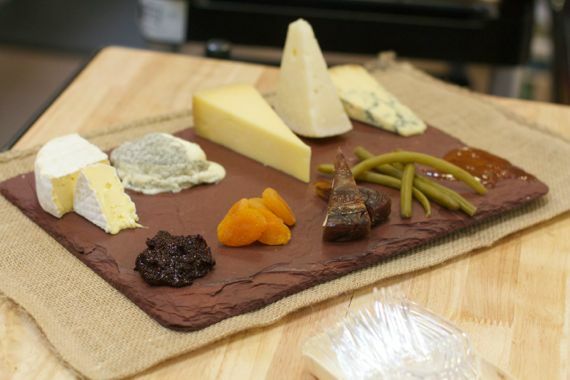 They carry Murray Cheese, founded in 1940 by Murray Greenberg, Murray in Greenwich Village, now a company that travels the globe looking to bring back cheese for it’s retail outlets and grocery store kiosks. 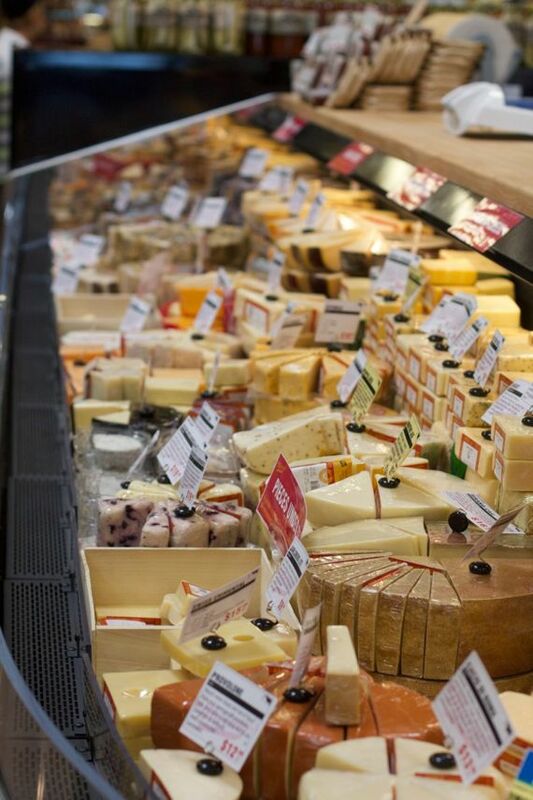 Each member of the cheese department gets structured training in cheese, in order to better serve you. Real Parmigiano Reggiano. You know how I feel about the king of cheeses. Do not buy anything but the real deal for your Italian dishes. Grate it at home. 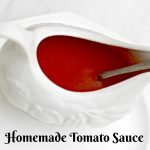 It can take plain marinara sauce and spaghetti to gourmet level. 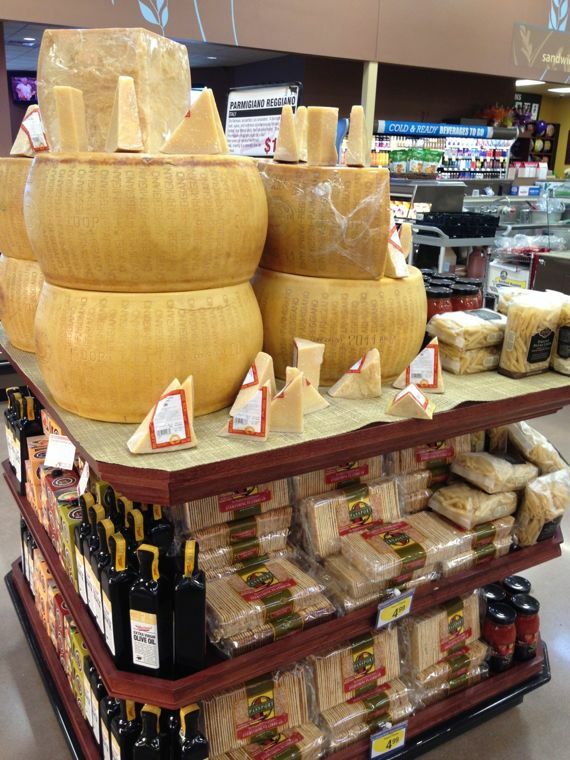 They also carry an Italian sheep’s cheese that we love. Cacio di Roma, is a table cheese, younger, less salty than Pecorino Romano, great for a cheese plate. 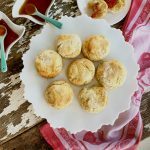 I made these quick and easy appetizers, which will be great for Memorial Day, July 4th or any dinner party. 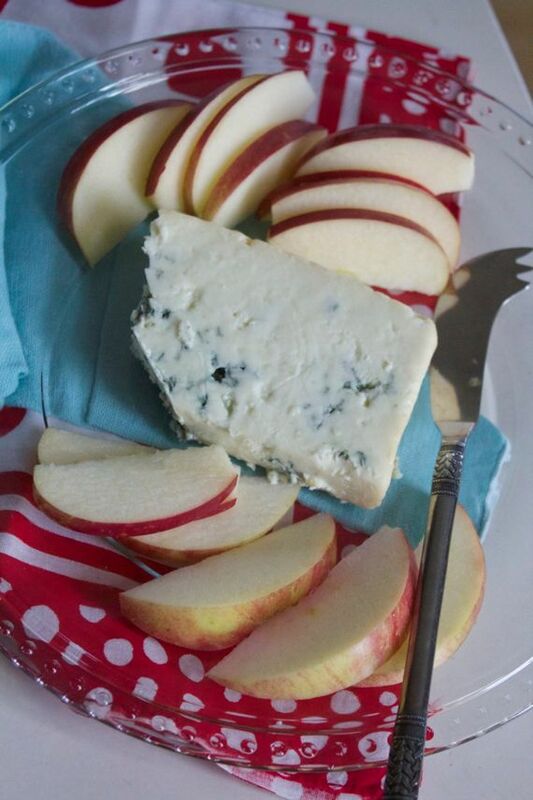 Start a party with crisp apple slices and room temperature smoked blue cheese. Smokehaus blue is smoked over real apple wood. 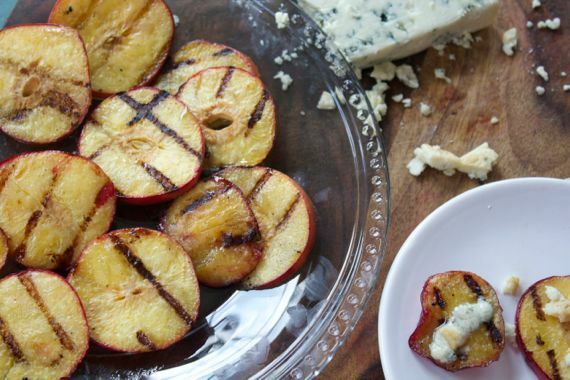 Or crumble blue cheese over warmed, grilled nectarines, also purchased at Kroger.Recipe for grilling nectarines can be found here along with a grilled peach and almond salad. What’s cheese without bread? I was super excited to see bread from La Brea Bread Company, making artisan bread for 25 years. We were each given a loaf of rosemary olive oil bread, a good and bad thing, because we ate the entire loaf in two days. The deli carries Boar’s Head, which is a premium brand of luncheon meats and cheeses. 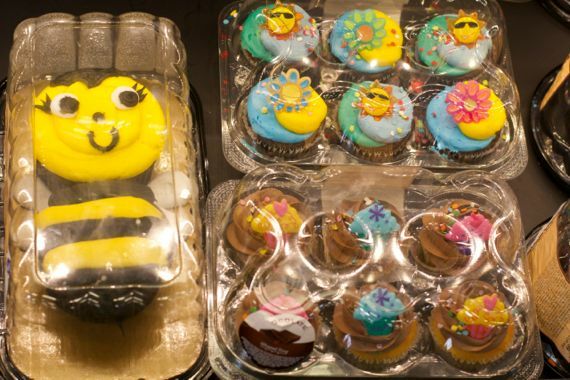 They also have a cupcake center with lots of ways to get your cupcakes decorated. The produce department really impressed me. I am always looking for local produce and Kroger has made a commitment to source locally when they can and they have negotiated some local farm purchases. There is 20 feet of organic produce, priced competitively. The day I was there, organic apples were at $.99 a pound. Unheard of and five pounds later, I can tell you how crisp and sweet they were. 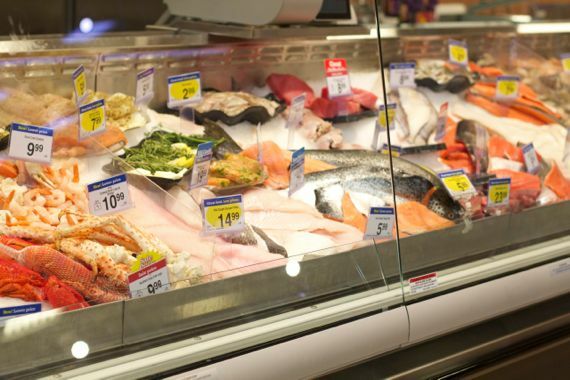 The seafood has a wide assortment as very competitive prices and a variety of farmed and wild-caught items, including live lobsters. They had a very competitive price for wild caught yellow fin tuna. 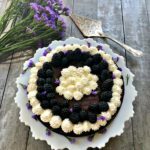 I have two amazing recipes for you, a wild tuna nicoise salad, Mr. Spinach’s Tiger’s personal favorite, seared tuna with pasta with olives and anchovy sauce. You can purchase the Italian olives at the Kroger olive bar. 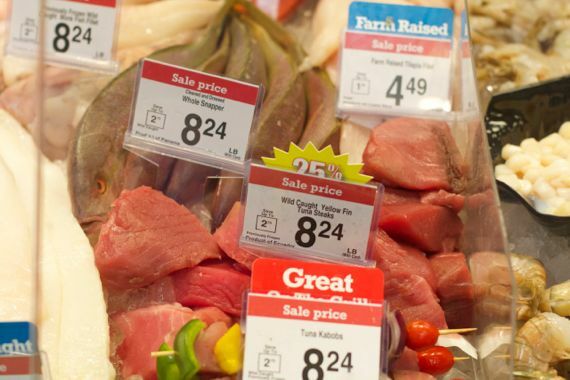 Grand opening prices on meat are incredible. We had filet Mignon for dinner tonight for under $10. 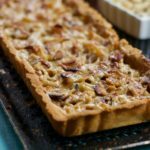 To busy to cook? Pick up something from the Bistro and take it home or eat in the cafe which also has wifi. Don’t forget to ask for the baking bags. 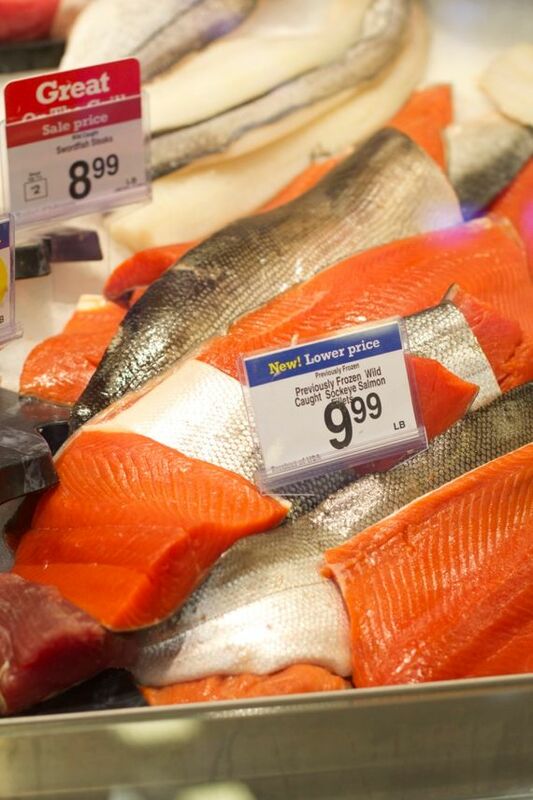 You can also pan fry or grill salmon with easy recipes. Bins of Natural Foods – We got to try peanut butter and almond butter made on the spot. 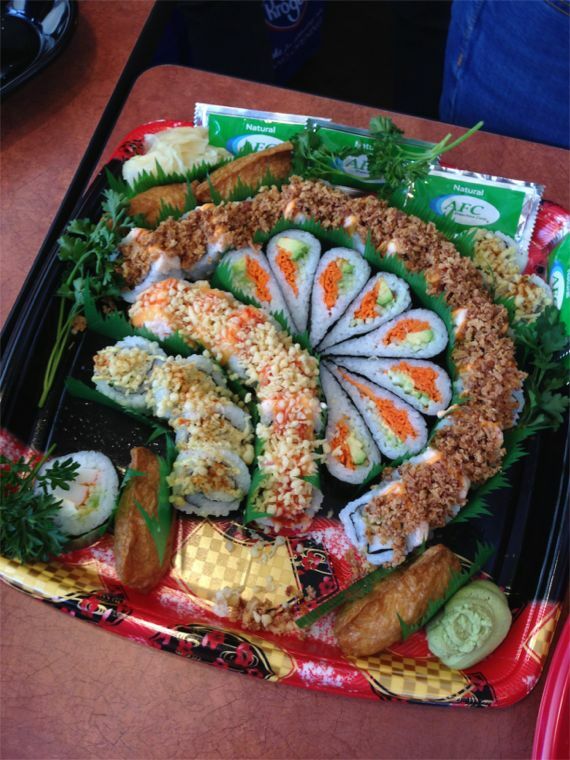 We got to try the fresh sushi several times. It was fresh, crunchy, and spicy. There is often a selection of free samples available. During our visit, we were served lunch. Sushi, grilled Manchego cheese and arugula sandwiches, open-faced tenderloin and more. Kroger then gifted each of us with four bags of goodies and two gift cards. The good news is that I’ve decided to share a $50 gift card with one of you. You can use it any Kroger, wherever you live. when you do, be sure to check out KrogerKrazy.com for the latest specials, kept up to date daily. It’s mandatory that you leave a comment on the rafflecopter. Good Luck! The Giveaway is Over. Jennifer Moyer of Ohio won. The rafflecopter picked a winner. Jennifer Moyer won. Disclosure: As part of a media event, I received two $50 gift cards and 4 swag bags valued at $100, and lunch. My opinions of Kroger Grocery store are my own. It was my choice to gift one of the $50 gift cards to you. I’d love to buy some of those white dishes you featured, but would probably get groceries. I would buy boneless chicken breast and fruit! I would buy diapers and household items. 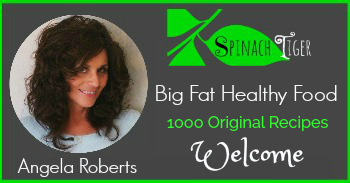 I will probably buy fresh produce and stock up on snack foods for our beach vacation coming up soon! I would buy lots of yummy fresh produce! I buy groceries, pre-made items from the deli/bakery, gas, gift cards, and I occasionally get a starbucks coffee while I shop. I love the fresh produce! I would buy meats, cheeses, fruit, crackers, hummus and drinks for a wonderful summer picnic! Thanks for a great giveaway! I would buy my regular weekly groceries. I would buy meat and cheese. I’d go to their deli and would buy some hummus and some crackers for dipping. Then I’d go to the flower section and buy some spring lilies, Then I’d go to the candy aisle and I’d get a big bag of peanut M&M’s. 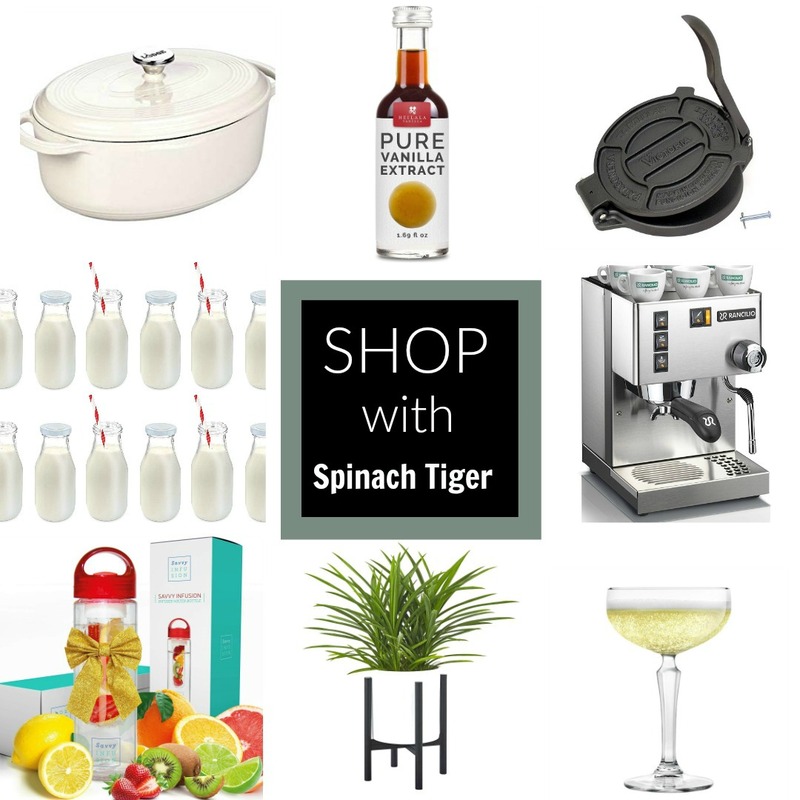 I’d share each of these items with friends and family and create a great kick-off to summer! I would buy some meat, boxes of noodles, and pasta sauce. 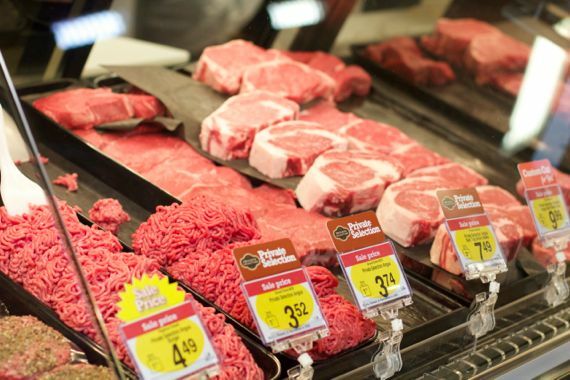 I’d stock up on meats for grilling this summer — burgers hot dogs and steaks! I’d get some organic goodies! I would buy some fresh fruit. I would buy produce and chicken breasts. I would buy lots of produce and some spices. I would buy meat and produce. I would put together a list of the food items we need and buy those. I’d buy boring old groceries. I do most of my shopping there. I like to buy my baking products there. 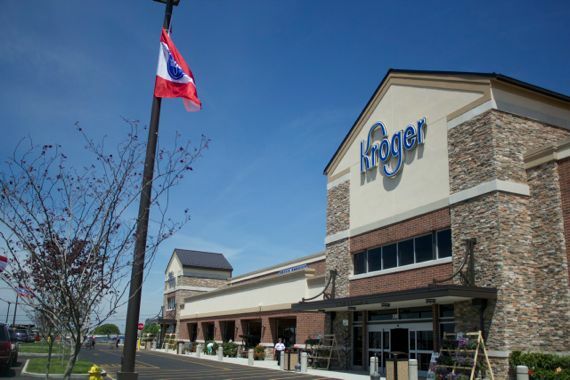 i would buy all my groceries at kroger! I would buy some meat. Love your photos. Makes me hungry! 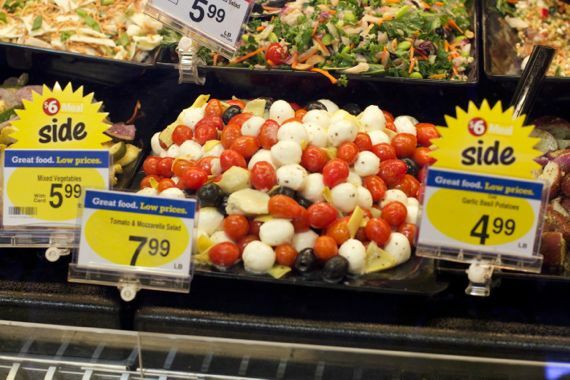 I would buy food from the salad bar and deli case! I would buy fres fruit and paper products. I would definitely get some meat from my Kroger. I’d like to get some new international foods. Everything! It’s where I grocery shop. I am so excited about the new cheese market that I saw at the Green Hills Kroger, as well, Murray Cheese. I buy all my groceries at Kroger. I’d buy meat and produce. I would buy shrimp and diet pepsi. I would buy some steaks for grilling. Would buy hamburgers and buns for a cookout. supplies, food and cake for my son’s birthday party! I would buy meat. That location looks ten times better than mine. Super jealous. I would buy a prime rib. I love buying the Noosa Yoghurt there! Yum yum! I have a party coming up in June and I would buy cake and ice-cream. I would buy some ribeyes! I would stock up in the organic department and deli cheeses. I would buy meat and fish. I would buy dairy products….including ice cream! 🙂 Thank you. I would buy items from their organic section. I would buy some deli meat and cheese platters for my family reunion! 50 at Kroger? Too cool. I would stock up on meat and veggies! I somehow find myself at Kroger weekly getting things not on my grocery list because we really enjoy their products! Can’t wait to check out their aged blue cheese at the cheese shop!! 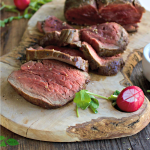 I would check out the meats like the Filet Minion…never had that before! I would love to try new food there! I’d like to stock up and treat my family to some bbq foods, like steak, burgers and hot dogs. Our grocery stores are sure coming a long way. The salmon and sushi looked very fresh. I liked the cheeses as well. I would love to get into the organic section and bring home some goodies! I would stock up on goodnights underpants for my two youngest, and fruit and meat for my 3 growing boys. Thanks for sharing your goodies! 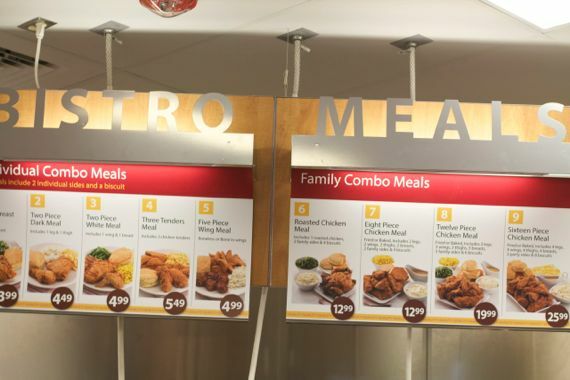 I’d try one of the family combo meals from the deli. 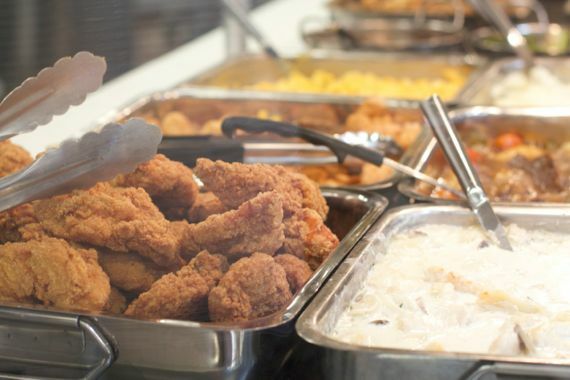 The fried chicken is usually really tasty! I would coupon and try to make it last as long as possible while buying the items my family needs! I would buy produce and Kroger brand products which are VERY good- every bit as good as the pricey name brands. I always appreciate the friendliness of the staff! I would stock up on produce. Woah! So many yummy foods to make! What a neat experience you got too! Milk, chicken, bread, ice cream and a few other things. I like their fresh fruits and vegetables and their selection of frozen entrees and pizzas is good too. such a great (and thorough!) 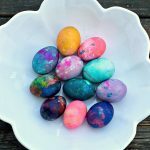 write-up! You did Kroger proud. Because they have the best deli and my daughter loves the olive bar. 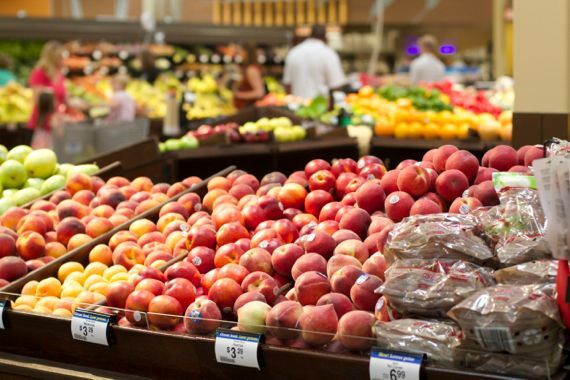 I would buy some produce – lettuce, tomatoes, and fruit – watermelon, grapes, apples! Groceries! Ha. I buy all sorts of things at Kroger, usually frozen foods, their Simple Truth line, etc. I like shopping in the organic section and buying the cereal, yogurt, & clif bars. I also like the bakery. I buy the fresh breads and the bagels. There jalapeno bagels are awesome. I’d buy produce with kroger gc. I’d but my usual groceries, and maybe add a little something special from their bakery that I usually don’t get. Kroger’s cake frosting is delicious! I will get deli and cakes. lots of cheeses, pork chops, some good veggies, the ice creams they have are so good!!!! I’d buy Real Parmigiano Reggiano. I love cheese! Love the new store. It is really convenient for us now. Love the gluten free selections. i love their cookies so i would buy those as well as some cake.